Field evidence is presented to demonstrate that a very large landslide blocked the Jinsha River (the main stem of the Yangtze) near the present day town of Qiaojia, Yunnan Province. The discovery is significant because no persistent river-blocking landslide has been reported so far downstream in a major catchment. At the location of the landslide dam the upstream catchment area is 445 × 103 km^2. Sediments deposited behind the dam indicate that the minimum crest height was approximately 200 m with a lake volume of 11.4 +/− 1.3 km^3. The landslide occurred on the western (Sichuan) side of the river and displaced an estimated volume of at least 3.75 km^3, with material riding up to 550 m above the river on the eastern (Yunnan) side of the valley. The location is at the intersection of the Xiaojiang and Zemuhe fault zones which form part of the eastern boundary fault of the Sichuan-Yunnan Fault Block, an area where many earthquakes exceeding magnitude 7.0 have been documented in the historical record. Evidence of a previously unrecognized ancient landslide which dammed the main stem of the Yangtze River, China is presented. The find is significant not only due to the huge dimensions of the landslide but because of the enormous catchment area impounded by the dam and the recognition that a river as large as the Yangtze has been – and can be - impacted by a persistent river-blocking landslide. The site of the dam is located 8 km upstream of the town of Qiaojia, Yunnan Province (26° 50’ 40” N; 102° 57’ 35” E). The Jinsha River (the name given to the main stem of the Yangtze upstream of Yibin) forms the provincial border between Sichuan and Yunnan. At the landslide dam location, the upstream catchment area is 445 × 103 km2. We believe this to be by far the largest catchment area ever reported for a significant landslide dam. Landslides forming natural dams across rivers have been described from a number of mountain environments [1–3]. Such features pose considerable hazards and consequently the topic has received increasing attention in recent years, including the margins of the Tibetan Plateau . Upstream of the blockage, backwater inundates the valley floor as a lake is formed. This increases pore water pressure which may induce secondary slope failures with the risk of displacement waves. At the dam site there is risk of breaching by overtopping, piping or slope failure which generates an outburst flood which may be catastrophic. An elevated flood wave can travel long distances downstream at high velocity. In China, documentary records of large earthquakes and river blocking landslides have enabled inventories to be compiled [5, 6]. However, the remote and rugged terrain shelters evidence both of recent landslide dams which escaped the attention of official records and of ancient landslides which occurred before documentary records. Recognition and interpretation of palaeo-landslides and their lake impoundments is vital to extend understanding of the frequency-magnitude and spatial characteristics of landslide dams. Increasing awareness has also challenged geomorphologists to re-evaluate the role of landslide dams in the fluvial sediment cascade . It has been demonstrated that landslide dams arrest rates of bedrock incision as alluvial fills inhibit headward erosion, while catastrophic dam failures may produce sediment yields many orders of magnitude greater than ‘normal’ rates [4, 8–10]. The location of a suspected ancient landslide on the Jinsha River (the main stem of the Yangtze) has been noted . In this paper, field evidence for the landslide and the reach impounded by its dam is presented. The study area is located in southwest China on the eastern boundary fault of the Sichuan-Yunnan Fault Block, sometimes referred to as the Kangdian Microplate (Figure 1). Historically there have been many large earthquakes associated with four major fault zones along this boundary . The Xiaojiang Fault Zone is a left lateral strike slip extending from Qiaojia southward towards Dongchuan, Yunnan Province where it splits into an eastern and western branch. The Songming M8.0 earthquake occurred on this fault zone in 1833. The Jinsha River turns abruptly north to flow along the fault zone for about 50 km from the confluence of the Xiaojiang to Qiaojia. Documentary records suggest that there has not been a major earthquake impacting this reach since the 1733 M7.7 Dongchuan Earthquake . From Qiaojia, the Zemuhe Fault Zone runs NNW for 110 km to Xichang. The M7.5 Xichang Earthquake occurred on this fault zone in 1850. There are several reports of short-lived landslide dams associated with earthquakes on the eastern boundary fault. 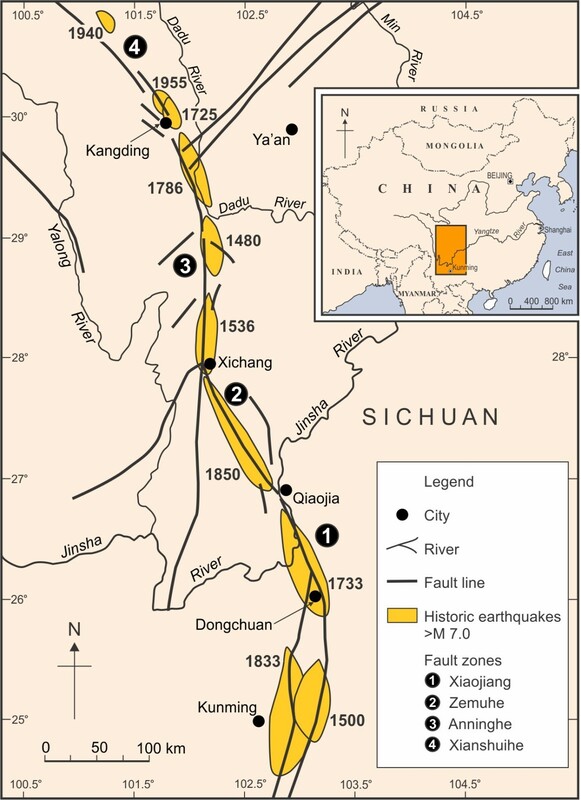 The most infamous is the M7.8 Garze Earthquake on the Xianshuihe Fault Zone in 1786. A landslide blocked the Dadu River (a tributary of the Yangzte) but the dam breached ten days later following a large aftershock. The resultant flood wave killed more than 100,000 people according to contemporaneous reports . In the Jinsha River, closer to the study area, two historical landslide dams have been recorded, though with limited detail. One landslide dam occurred in 1880 in Qiaojia County  and another was reported further upstream in Huili County in 1935 . However, the field evidence for a lake forming behind a landslide dam indicates a much larger feature than any event reported in historical documents. This paper reports preliminary reconnaissance fieldwork to establish the location and size of the landslide event and the dimensions of the lake formed as a result. Map of Southwest China identifying the location of palaeo-landslide near Qiaojia, Yunnan. The principal feature of the map is the Eastern Boundary of the Sichuan-Yunnan Fault Block. The palaeo-landslide site is at junction of Xiaojiang and Zemuhe Fault Zones. Areas impacted by significant historical earthquakes M > 7.0 are indicated [12, 13]. The evidence for the landslide dam has been gathered from fieldwork reconnaissance together with analysis of geological maps, satellite imagery and digital elevation models. The initial impetus for the analysis was the recognition of substantial sand and gravel deposits in the Jinsha valley. These deposits are infrequently exposed at the land surface as most of the valley sides are draped by colluvial or landslide deposits derived from higher slopes. However, there are three active sand quarries in the vicinity and various exposures in incised gullies. The sediments are sub-horizontally laminated dark grey sands and gravels typically arranged in fining upward units capped with imbricated armoring. Typically couplets are at intervals of 8–10 cm apart indicating pulses of sedimentation in flowing water. The Geological Survey of China has indicated some areas of Quaternary deposition in this part of the Jinsha Valley, indicating that the presence of the sand and gravels has been recognized. However, it appears that Quaternary deposits have been assumed to be remnant fluvial terraces. 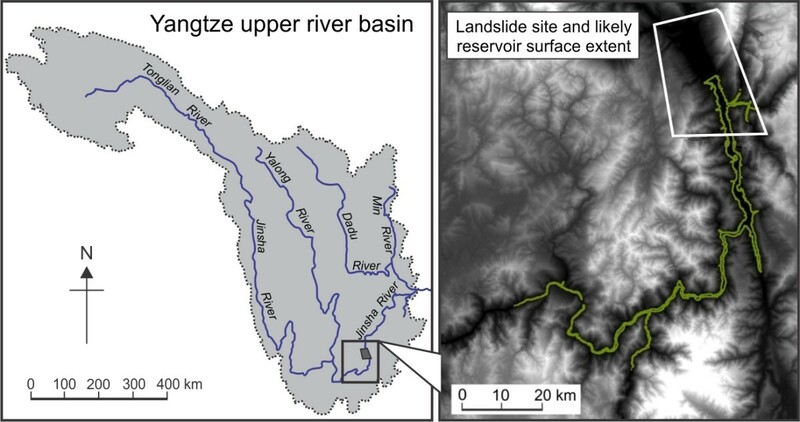 Recent work  has demonstrated that many deposits along river corridors in high mountain environments may be related to landslide dams as either deposition of sediment within a lake impoundment or as the beveling of landslide and associated slope deposits along a temporary lake shore. In the present example, the distribution of sand and gravel deposits was mapped so that the horizontal and vertical extent could be determined. Direct field observations and sampling of sediments has been supplemented by field mapping of bench surfaces along the Jinsha valley and its tributaries. The maximum elevation of the landslide dam deposit is at 845 m. This exposure is revealed in a series of hillslope gullies above an active sand quarry near the confluence of the Jinsha and Xiaojiang River (26° 30’ 22” N; 102° 03’ 56” E). A distinctive bench at the same elevation extends along the eastern side of the Xiaojiang River and can also be traced in pockets of the steep-sided Jinsha valley upstream of the confluence. The downstream extent of the deposit was then traced to identify the most likely landslide location. 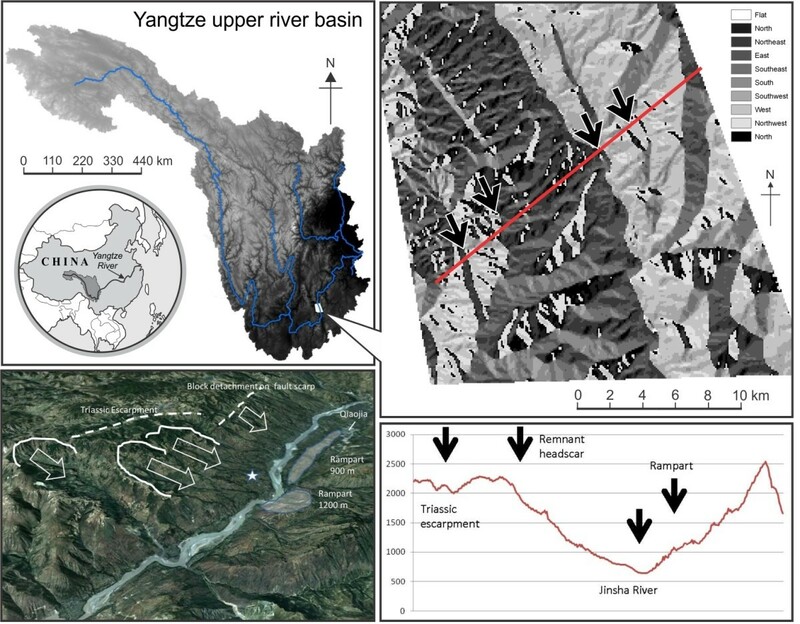 The most northerly extent of the deposit was observed in the sidewall of a gully in agricultural land in the village of Yanpengzi (26° 50’ 13” N; 106° 52’ 56” E) at an elevation of 790 m on the western side of the river. Downstream of this location the material exposed in gully walls is indicative of debris flow deposits with poorly sorted angular clasts of mixed lithology in a reddish matrix. 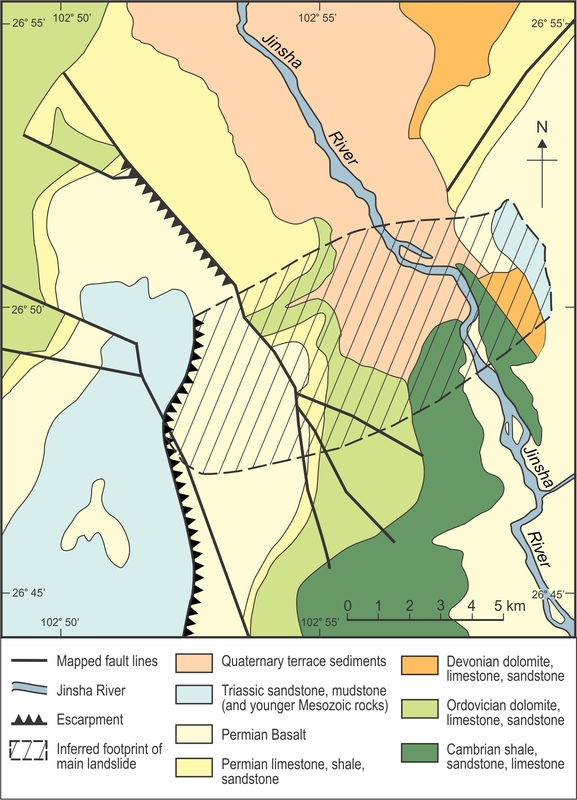 On the opposite (eastern) side of the river an extensive rampart of material with a similar reddish matrix extends to approximately 1200 m, while an elongated ridge with a crest elevation of 900 m extends some 6 km downstream, parallel to the present river course (Figure 2). The source area for the landslide is on the western (Sichuan) side of the river. Triassic sandstones form the ridge line above the river and occur in a syncline which is dipping northwards at 10-20°. The Geological Survey of China has mapped the above-mentioned rampart on the eastern side of the river as an outcrop of similar Triassic rocks. However, these Triassic rocks are not in situ east of the fault line and must originate from detachment from the Sichuan side of the river, where they form a prominent escarpment at 2000 to 2500 m elevation at a distance from 8–10 km from the river (Figure 3). Photograph of part of palaeo-landslide rampart on eastern (Yunnan) side of river (far left, indicated by left arrow). The landslide mass originates from the western (Sichuan) side of the river, behind the observation point for the photograph. In 1880 a landslide from the Yunnan side blocked the Jinsha for three days . The location of the 1880 slide is indicated by the right arrow. The scar and rampart of the more recent slide event is more obvious than the evidence for the palaeo-landslide. Simplified geological map of study area indicating inferred footprint of landslide. Map is derived from Geological Survey of China. At ground level it is difficult to delimit the landslide complex but using satellite imagery and digital elevation models the landslide location and volume can be estimated. The topography suggests two principal headscars and run-out tracks a short distance below the Triassic escarpment (Figure 4). The length of the track from the headscars to the river is at least 7.5 km with a width of 5 km. Given the antiquity of the slide estimating the depth to the shear surface from the topography is difficult and hence any estimate of the volume of the disturbed mass is provisional. Analysis of some of the largest terrestrial landlsides  suggested an assumed average depth of 100 m is reasonable. The volume of the landslide displaced from the Sichuan side of the river would then be at least 3.75 km3. Though the site requires a more detailed field investigation, the estimate suggests it is among the largest terrestrial landslides previously identified (within the top 100 sites identified) and may be considerably larger. A back-tilted linear feature extends along a fault line running north from the dam site suggesting a block detachment process continuing for 8 km downstream. A rampart at an elevation of 900 m extends for the same distance along the eastern side of the river as far as Qiaojia. Evidence for palaeo-landslide inferred from digital data. Location of landslide dam is shown in upper left panel on map of the Upper Yangtze basin. The reach indicated in the inset is displayed as an aspect map derived from SRTM data. Lighter shades indicate west-facing slopes and darker shades east-facing slopes. The shading indicates anomalies in the valley side slopes (upper right panel) where the general slope direction is reversed. The red line is a cross section perpendicular to river which is displayed in the lower right panel. The four arrows on the cross section and the aspect map identify location of Triassic escarpment and remnant headscar on the Sichuan side of river, the main river and location of Triassic rampart on the Yunnan side of river. The relationship of these features is annotated on a Google Earth oblique aerial view looking downstream towards Qiaojia (lower left panel). The view is to the northwest with the river flowing due north towards the top right of the scene. The star symbol marks the furthest downstream exposure of palaeo-lake deposits. The Triassic escarpment is a dominant topographic feature on the western side of the river. At the landslide location, the present day elevation of the river is 650 m. Based on a maximum elevation of sand deposits and associated benches in the inundated area of 845 ± 10 m, it is estimated that the minimum height of the landslide dam was approximately 200 m. Backfilling a digital elevation model derived from 3-arc-second Shuttle Radar Topography Mission (STRM) data, the dimensions of the lake can be estimated (Figure 5). The lake extended a length of 105 ± 4 km up the Jinsha Valley and was 1–2 km wide between the Xiaojiang confluence and the dam site. The estimated lake volume was 11.4 ± 1.3 km3. Contemporary annual discharge measured at Huantan (1962–1987), the nearest gauging station downstream is 122 ± 21 km3, suggesting that the lake would fill rapidly (between 15 to 100 days depending on whether the event occurred during summer monsoon or winter dry season). However, this also raises the question of how such a large river could be blocked by landslide debris. Ongoing work is seeking to date the lake sediments to establish both the occurrence and duration of the landslide dam. As climate conditions during the Last Glacial Maximum (c. 22 kBP) were colder and drier than present, the discharge of the Jinsha would have been significantly lower and the probability of landslide blocking the valley would have been higher . Dimensions of palaeo-lake derived from back-filling SRTM-derived DEM to maximum observed elevation of deposits. Note that the Xiaojiang tributary which marks the fault line is much steeper than the main Jinsha valley. The lake volume of the Jinsha landslide dam is similar to the largest known event in historic times – the 1911 Usoi Dam in Tajikistan . However, its significance is the recognition that landsliding is capable of disrupting one of the world’s largest rivers at a considerable distance downstream. This merits reappraisal of the potential hazard posed by earthquake triggered landslide dams. In comparison, the 2008 Wenchuan Earthquake generated more than 250 landslide dams, but the largest of these at Tangjiashan, which causes considerable hazard management challenges, impounds a lake volume three orders of magnitude smaller than the Jinsha landslide dam [17, 18]. An empirical relationship to predict peak discharge from catastrophic failure of natural dams , Qp = 0.3 [VD]0.49 where Qp = peak discharge (m3 s−1); V = lake volume (m3); D = lake depth (m), suggests a peak discharge > 300,000 m3 s−1 if the dam failed catastrophically with a resultant flood wave impacting the channel downstream for several hundred kilometers. Furthermore, as the river enters a steep gorge downstream of Qiaojia where the active channel width is only 120–200 m, the unit stream power of a dam failure flood would be extremely high. The natural damming of rivers by landslides is a significant hazard in the seismically active, mountainous terrain of Southwest China. Geological and geomorphological methods to identify landslide hazard potential are especially important in a region experiencing rapid urban development, widespread land use change and the construction of water resources projects on major rivers. New techniques based on the interpretation of satellite imagery and digital elevation models are enabling more detail about past and present landslide distributions to be generated. There is increased awareness that river-blocking landslides have been more widespread than the documentary records suggest and that Quaternary sediments traditionally assumed to be fluvial terraces may need to be reinterpreted. The recognition of palaeo-landslides capable of creating very large lake volumes necessitates reappraisal of hazard assessment. In the case of eastern boundary fault of the Sichuan-Yunnan block it is apparent that high magnitude earthquakes have potential to generate massive slope failures. The range of hazards related to landslide dams in the Qiaojia area will soon be supplemented. In the gorge section downstream of Qiaojia, construction of the Beihetan Dam is now underway. Once completed it will be the third largest hydropower project in the world. Ironically, the design water level for the dam is 825 m so the reservoir will occupy the majority of the terrain once inundated by the landslide dam and, in doing so, will drown the majority of the field evidence for the palaeo-lake. The presence of the reservoir introduces the additional hazard of earthquake-generated landslides causing displacement waves. The need for vigilance in assessing seismic and slope stability hazards is apparent. This study was supported by Chinese Academy of Sciences (Grant KZCX2-XB3-09) and by the Ministry of Education (Singapore) Academic Research Fund (Grant R-109-000-152-112). DLH conducted fieldwork and wrote the first draft of the paper. XB identified the landslide site and undertook fieldwork. WL, QT and XB undertook fieldwork analysis. SF did the GIS analysis. All authors read and approved the final manuscript.